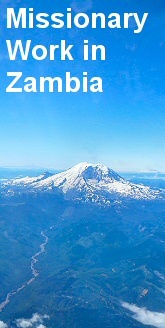 As the days are lengthening for you, so they are shortening in Zambia, and the cold season will soon be upon us. Already people are wearing their thick woollen coats or anoraks and the kids are putting on gloves to go to school, of course everything is relative, the temperature here is still climbing into the high 20's centigrade during the day and frost is practically unknown, but we in Zambia are still feeling the cold! This past few months has been a time of change. Most notably, the departure of the Rev Colin Johnston from Zambia, where he has spent 15 years in service; the last four were in Kitwe at the United Church of Zambia theological college. Colin goes to take up a post in Galilee and I wish him God’s very best in his new job. His wry humour, dedication to the job in hand and generous spirit will be greatly missed. A small compensation is that I have been able to buy his Toyota pick up and will be able to put it to good use in the compounds. It has already been useful in ferrying people and items so the groups can show off their wares at the MEF stand in the local agricultural show. In May I carried out a similar survey at Kamatipa to the one quoted for Ipusukilo in my last letter, with similar results. Both groups want to prioritise income generation, but finding something innovative and marketable is proving difficult. The market seems to be flooded with things they can already make, (doormats, crochet work and knitwear) and people are reluctant to commit to something that is not tried and tested. I am hoping to get one group interested in a weekend market stall in Kitwe in the near future. This is where the little van will come into its own, - thanks Colin! Some members of the Kamatipa group have done a carpentry course and are keen to try out their skills. I have also got them a teacher for tailoring which will start at the end of June when she gets back from harvesting at her farm. The Ipusukilo group have decided to open up and run a water kiosk in order to get better access to cheap clean water. As lpusukilo, like Topsy, "just growed” there is very little infrastructure, and piped water to the jumble of mud brick homes is not feasible. 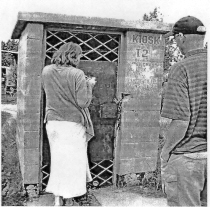 The water company has sited several water kiosks (virtually lockable standpipes) in the compound instead, but there is a general reluctance to use water from this source as traditionally people believe well water is more beneficial. We found a kiosk within walking distance which had not been vandalised, and are making enquiries about - opening it up for public use. This Easter I was lucky enough to visit the Kombuku in Mongu (a full days travel from Kitwe). This is the ceremony where the Lozi King travels from his wet season residence to his dry season palace. Although Mongu is some 20 kilometres from the mighty Zambezi, it has a fully fledged harbour as it is situated on the edge of the flood plain. 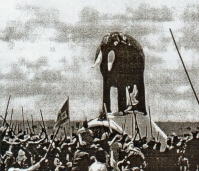 We travelled for an hour or so by canoe to see the King set off in his splendid elephant topped barge. 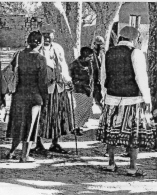 The Lozi tribal dress is said to have been adopted early last century when their king visited the UK and was most impressed with Scots kilts and Tam O’Shanter’s. What do you think? The sea of red hats is from the kings oarsmen who rowed the elephant barge over the long journey to the dry season palace. Some oarsmen preferred traditional leopard skins to the kilts seen in this picture. To keep us entertained whilst waiting for the king to board the boat, there was an official eulogiser who addressed the crowd at some length about the merits and attributes of his royal highness!